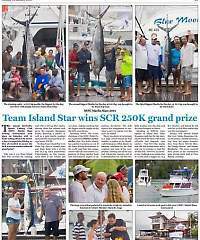 The Seychelles Sports Fishing Club (SSFC) has again last week organized their Marlin Slam Fishing Tournament that saw 18 boats set off at 3 am for a full day of competition. For the first time in Seychelles, a Seychelles Rupees 250,000 (a quarter of a million Seychelles Rupees - approximately US$20,000) was announced as the prize for the winner of this one-day competition. This year it was Team Island Star who secured the winning seat with a 212 kg blue marlin, earning them the colossal cash prize, the exquisite champions trophy depicting a marlin, as well as a gold marlin pendant sponsored by local jewelry design house JOUEL. Trailing Team Island Star were Team Top Gun in second place and Team Kuki with a 94.5kg and 52.5 kg catch respectively. Unfortunately in this tournament there is one winner and one prize, making anything but the biggest marlin caught on the day little consolation. In total, 5 Marlin were caught during the tournament. That was not all that was caught in the tournament. Multiple Dorado, Wahoo, Dogtooth Tuna and Yellowfin Tuna were also brought to the weigh station. The largest of all of these species was an 18.5kg Dogtooth Tuna. Seychelles has always been known as a Big Game Fishing paradise and marketed as such by the island`s Tourism Board, but the new drive by fishing enthusiasts since the last couple of years has brought a new dimension to Big Game Fishing Competition in Seychelles. The abundant seas of these mid-ocean islands have always attracted Big Game Fishing amateurs, but now the Seychelles Sports Fishing Club (SSFC) is making the sport an affair set to attract more and more professionals who follow such competitions around the world. Alain St.Ange, the Seychelles Minister responsible for Tourism and Culture, was personally at Eden Island`s Boardwalk Restaurant to watch the eighteen boats return to port from their day competition, and he said that it was important for the Tourism Board to work with the Seychelles Sports Fishing Club (SSFC) to include such a Marlin Slam Fishing Tournament as a national event on the Tourism Board`s Calendar of Events. "Being present as the fishing boats were returning to port, seeing the excitement by the big crowd gathered to see the catch as they are weighed, seeing the expression of joy by both the Seychellois and tourists present as one big marlin after the other was pulled up and weighed, showed that the event needs to be publicized and made more visible than it was," Minister St.Ange said. The next tournament is the Seychelles National Fishing Tournament which is a 2 day tournament starting on Friday, 11th April and concluding on Saturday, 12th April 2014. The tournament requires a good strategy since the winners will be declared based on their catches of both trolling and bottom fishing. "We welcome all anglers from across the world to plan their vacation to coincide with one of our Seychelles Sports Fishing Club Tournaments. We will assist all tourists wanting to participate," said Grant Heyer, Executive Secretary Seychelles Sports Fishing Club.